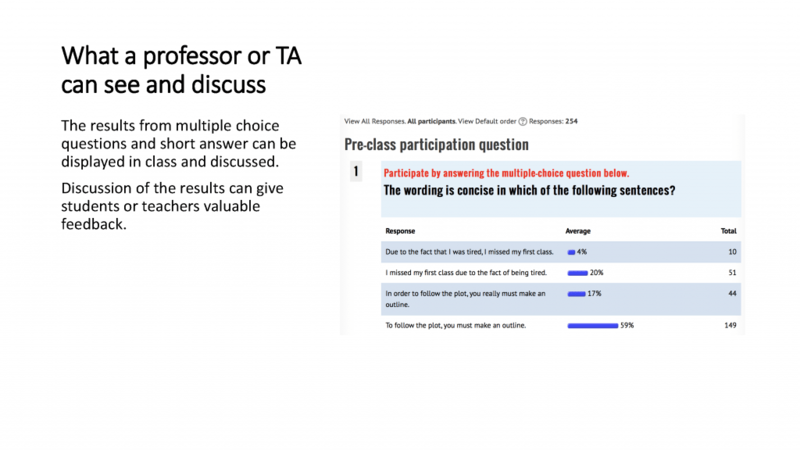 • Can facilitate class engagement for learning. 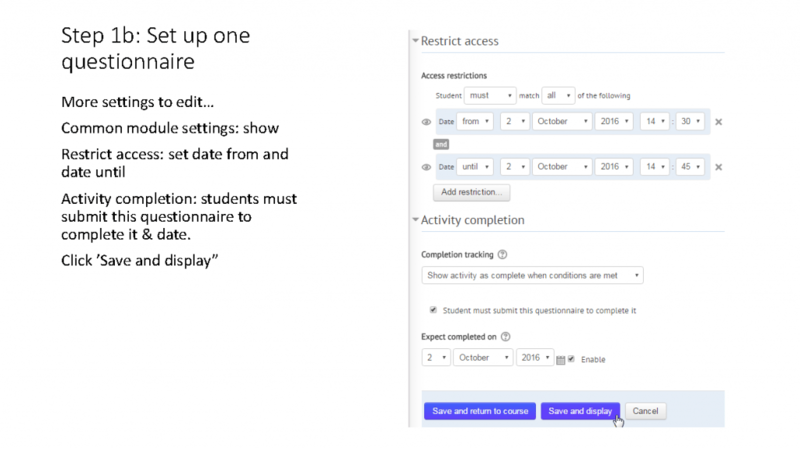 An advantage of using Moodle to take attendance is that when a student answers an attendance question on their mobile device, a record is automatically created in Moodle, which is accessible to both the student and the instructor. 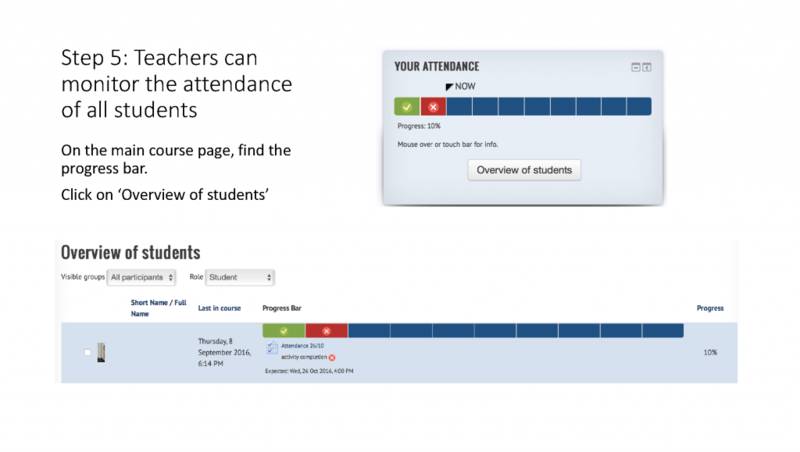 The attendance record for the whole class can easily be exported from Moodle to a simple report in Excel. Alternatively, the question could focus on assigned reading or problems for that day’s class (entry ticket). 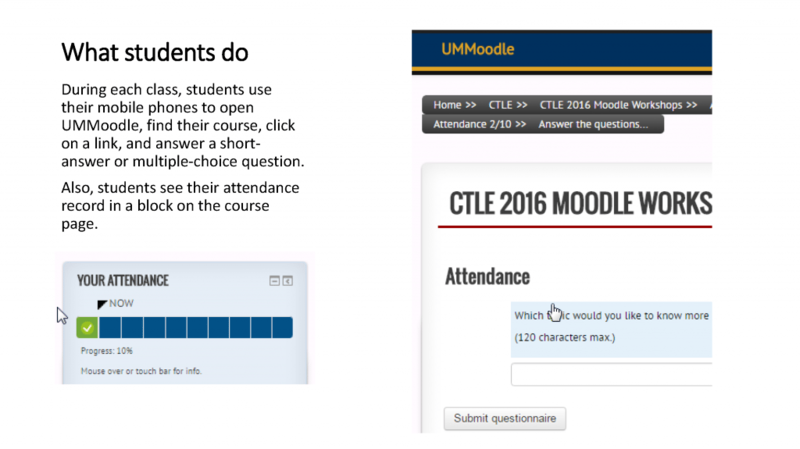 A summary of results from the entry or exit ticket questions can be viewed in Moodle by teachers and discussed in class. 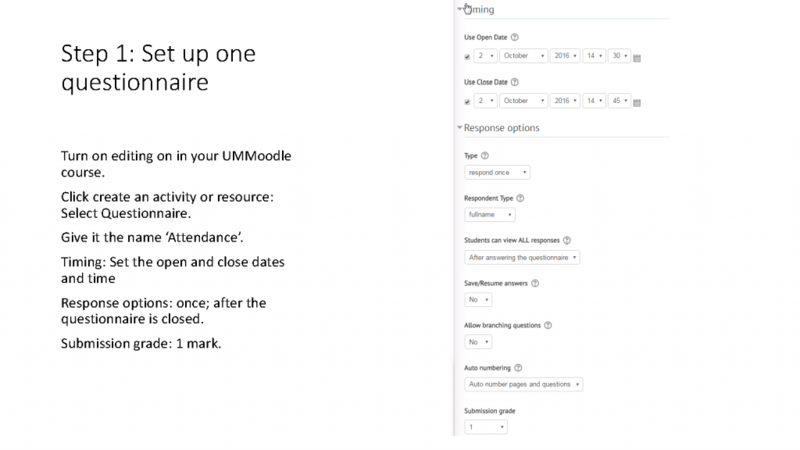 When a student responds to a question, regardless if the answer is correct or accurate, a mark is immediately recorded in Moodle. 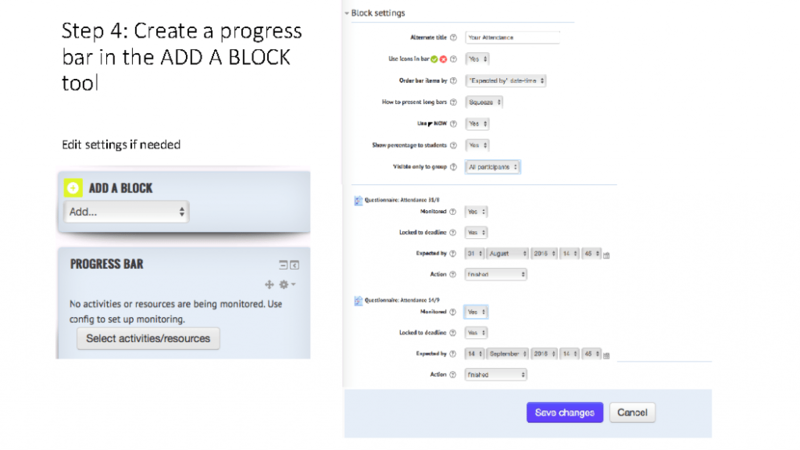 Moodle can be set up to display and remind each student of their attendance records by turning on completion tracking and adding a progress bar in the block function tool. A few additional steps can be taken to prevent students from answering questions outside of the classroom. 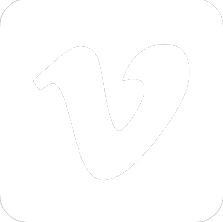 Create one question in your questionnaire in UMMoodle which asks students to write a number. Then, when students are in the classroom, give each student one piece of paper with a unique number, i.e., from 1 to 30. Students must then provide the number which is on their slip of paper when they answer the attendance questions in UMMoodle. So, no duplicate should be recorded in the questionnaire results. When there were duplicates, I would send a message to both students with the same number asking for an explanation. That message seems to put peer pressure on students. Also, I insisted students to use the UM WiFi so that there was further evidence that they were or were not in the same classroom as other students. 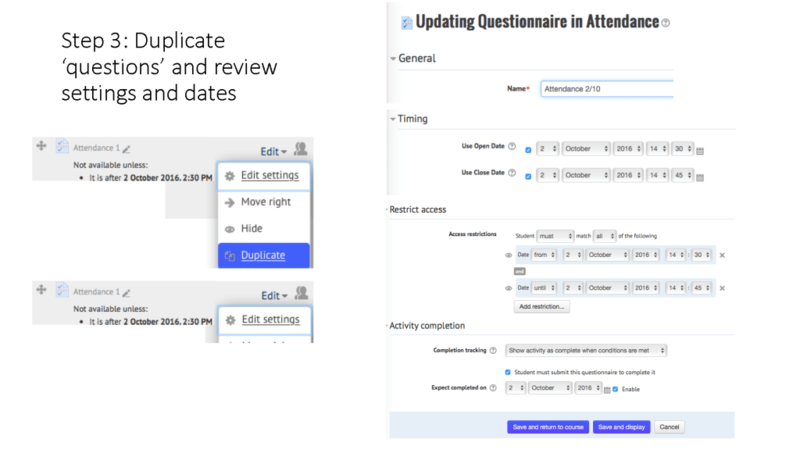 The approach described here was the most effective approach my colleagues and I devised, and after implementing this approach students became aware that it would be difficult to successfully complete attendance/feedback/assessment questions if they did not attend class. Any suggestions or comments would be most welcome. 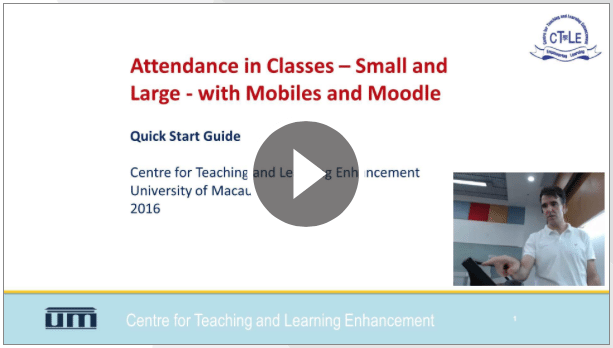 Download the quick start guide (pdf) below to learn how to set up attendance questions for your course. 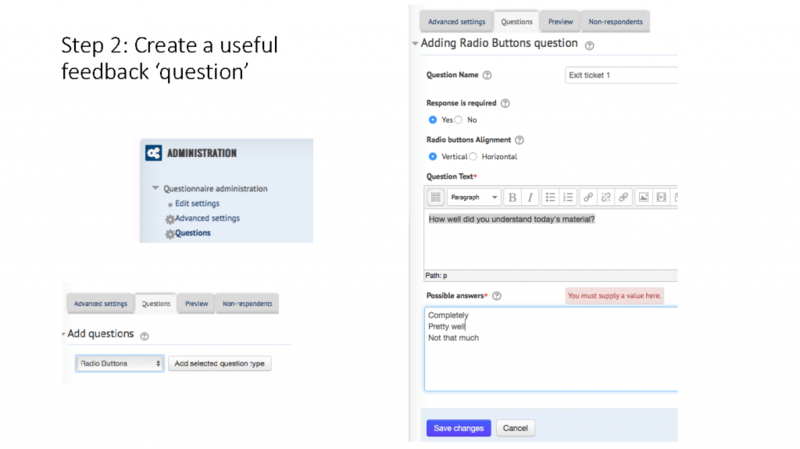 After creating one question, save time by duplicating it for the other classes or sessions. 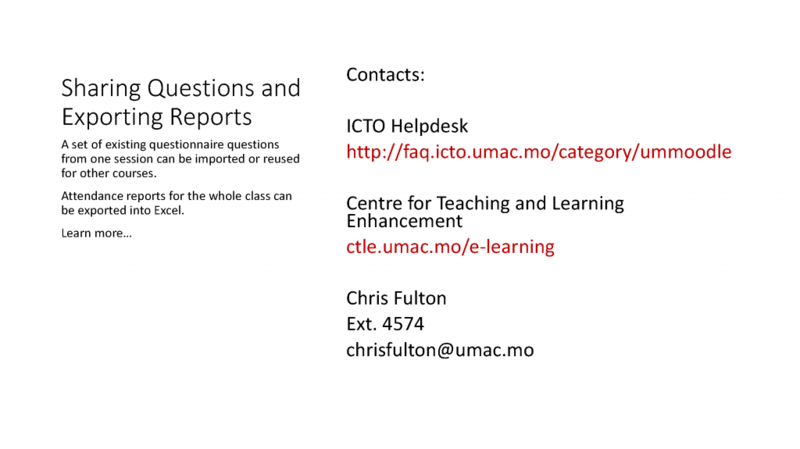 To discuss with an e-learning specialist how technology can be used to enhance your teaching practices, individuals are welcome to request an appointment with Chris Fulton. He can be reached by email or phone at chrisfulton@um.edu.mo or 8822-4574. 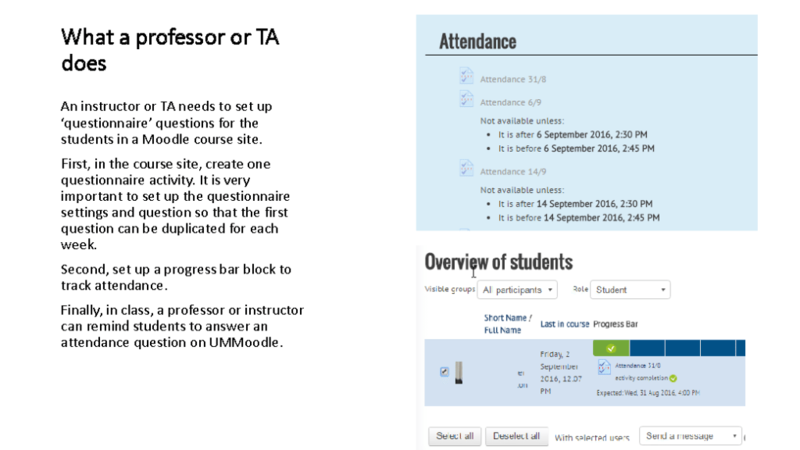 Personal assistance can also be requested using an online form at https://ctle.um.edu.mo/portfolio-items/moodle-consultation/.